The 17953 connects a vertical 1-inch pipe to a horizontal 1-inch pipe. The 17953 is typically used to attach a sensor with a 1-inch vertical pipe mount to a CM202, CM204, or CM206 crossarm. The CM216 provides both a 3/4-inch IPS (1.05-inch OD) and a 1-inch IPS (1.32-inch OD) mounting pipe that extends 4 inches above the mast. The LLAC4 is a small peripheral that increases the number of low-level ac signals a datalogger can monitor. The LLAC4 is often used to measure up to four anemometers, and it is especially useful for wind profiling applications. The 05106CBL-L is a replacement cable for the 05108 Wind Monitor. This cable has a connector on one end of it. The connector attaches to a 3-ft cable that is fastened to the Wind Monitor. Because the 05106CBL-L attaches to another 3-ft cable, the 05106CBL-L is typically ordered with an 8-, 21-, or 31-ft length to result in a total cable length of 11, 24, or 34 ft. 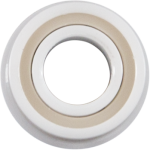 The 32118 bearings are located in the propeller housing of the 05108-45-L and can be replaced by most users—especially those who are familiar with replacing bearings in other mechanical systems. 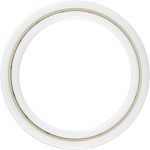 The bearings may also be replaced at the factory; an RMA (Returned Material Authorization) is required for factory replacement. The 32117 bearings allow the vane of the 05108-45-L to turn about the axis of the mounting shaft. These bearings are located within the shaft assembly and should be replaced at the factory. An RMA (Returned Material Authorization) is required for factory replacement. The 3659 aluminum pipe is used to mount the 05108.